Upon arrival in Casablanca, the economic capital of Morocco, you will be met and transferred by shuttle bus to your Casablanca hotel. Depending on arrival time, you will visit the city, including an optional visit to the Hassan II, one of the world's biggest mosques. Dinner and overnight will be in your hotel. 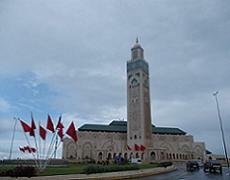 After breakfast at your hotel in Casablanca, you will meet our driver/guide, who speaks your language, to start the tour with a visit of Casablanca with the exterior part of the grand mosque Hassan II. 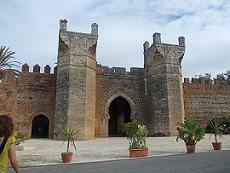 After lunch we will depart to visit Rabat which is the administrative capital of Morocco. Dinner and overnight at hotel. 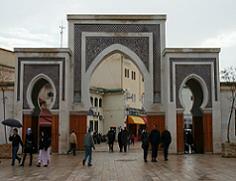 your After Breakfast you will visit Fes which is the imperial city the we will visit . . Then we . andspiritual capitalof the Kingdom. In FestheMederssaAttarine, the fountainNejjarineand the first universityKaraouineLunch will be in aformer palace of Medinacontinueof the visit ofFesJdid andits walls,the royal palace anda panoramic view ofthe old cityDinnerand overnight athotel/ Riad. Breakfast and departure from Fes to visit Moulay Idriss, the holy city for Muslims, where the mausoleum of Moulay Idriss, founder of the first dynasty Idrisside. 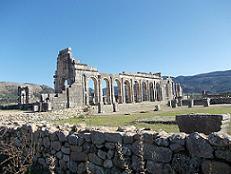 Then continue to visit Volubilis and its Roman ruins. After lunch you will return to your hotel in Fes for dinner and overnight. After an early breakfast our driver/guide will meet you for departing to Marrakech via Immouzer Kandar, a Berber village, Ifrane, a delightful ski resort, and Azrou, a Berber village known for its handicraft cooperative famous for its wood carving and carpet weaving. After lunch in Beni Mellal, we will continue to Marrakech where you will have dinner and spend night in your hotel/Riad. Breakfast at the hotel and then depart for a private tour of Marrakech: The visit includes The Koutabia mosque minaret the most recognisable land mark in Marrakech. Visit the Ben Yousseff Medresa which looks so beautiful that you could stare at the stucco decorations and mosaics for hours. The museum of Marrakech which hosts a number of traditional Berber costumes, jewellery etc. and the Bahia Palace which is a magnificent edifice giving the exact impression how it must have been living a rich and lavish life of a sultan. After lunch visit the world famous Jemaa- el –fena square one of the most important land marks in the world. Spend the evening in this amazing market witnessing orange juice vendors, snake charmers, food stalls, dancers, musicians, story tellers, fortune tellers etc. dinner and overnight at your hotel/Riad in Marrakech. Today we drive from Marrakech to the Atlas Mountains. Today you will find yourselves in the heart of the Berber countryside where paths lead to picturesque villages and hamlets, through forests and hunting reserves filled with wild-life. As you know the High Atlas chain is the highest mountain range in North Africa, provides an inexhaustible supply of water. It is a spine made up of a series of forbidding mountains, making access difficult, although there are passes along three axes. Behind each pass, we find many villages, generally built by stones or by earth mixed with water. In the high Atlas we meet only Berbers, the first people living in North Africa. Berbers still keep their traditions and wear traditional dress. After lunch at the Ouirgane village, you arrive back at your hotel/Riad in Marrakech to take some rest until evening when you can make a tour in squareDjemma-el-fna .